Glen Innes, Auckland, New Zealand. OBJECTIVE: To study the immediate sensorimotor neurophysiological effects of cervical spine manipulation using somatosensory evoked potentials (SEPs). 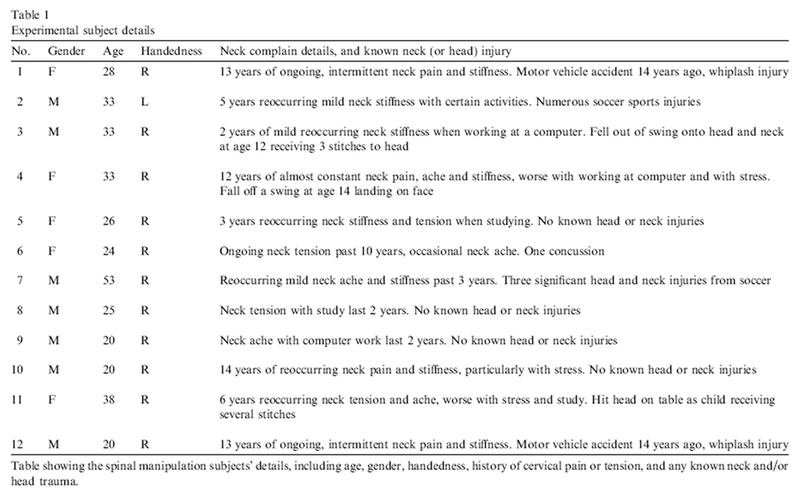 METHODS: Twelve subjects with a history of reoccurring neck stiffness and/or neck pain, but no acute symptoms at the time of the study were invited to participate in the study. An additional twelve subjects participated in a passive head movement control experiment. Spinal (N11, N13) brainstem (P14) and cortical (N20, N30) SEPs to median nerve stimulation were recorded before and for 30min after a single session of cervical spine manipulation, or passive head movement. RESULTS: There was a significant decrease in the amplitude of parietal N20 and frontal N30 SEP components following the single session of cervical spine manipulation compared to pre-manipulation baseline values. These changes lasted on average 20min following the manipulation intervention. No changes were observed in the passive head movement control condition. CONCLUSIONS: Spinal manipulation of dysfunctional cervical joints can lead to transient cortical plastic changes, as demonstrated by attenuation of cortical somatosensory evoked responses. SIGNIFICANCE: This study suggests that cervical spine manipulation may alter cortical somatosensory processing and sensorimotor integration. These findings may help to elucidate the mechanisms responsible for the effective relief of pain and restoration of functional ability documented following spinal manipulation treatment. Spinal manipulation is a commonly used conservative treatment for neck, back, and pelvic pain. The effectiveness of spinal manipulation in the treatment of acute and chronic low back and neck pain has been well established by outcome- based research (for review, see Hurwitz et al., 1996 and; Vernon, 1996). However, the mechanism(s) responsible for the effective relief of pain and restoration of functional ability after spinal manipulation are not well understood, as there is limited evidence to date regarding the neurophysiological effects of spinal manipulation. The evidence to date indicates that spinal manipulation can lead to alterations in reflex excitability (Herzog et al., 1999; Murphy et al., 1995; Symons et al., 2000), altered sensory processing (Zhu et al., 2000, 1993) and altered motor excitability (Herzog et al., 1999; Dishman et al., 2002; Suter et al., 2000). Spinal manipulation is used therapeutically by a number of health professionals, including physical medicine specialists, physiotherapists, osteopaths and chiropractors. The different professions have different terminology for the ‘‘entity’’ or ‘‘manipulable lesion’’ that they manipulate. This manipulable lesion may be called ‘‘vertebral (spinal) lesion’’ by physical medical specialists or physiotherapists, ‘‘somatic dysfunction’’ or ‘‘spinal lesion’’ by osteopaths, and ‘‘vertebral subluxation’’ or ‘‘spinal fixation’’ by chiropractors (Leach, 1986). Joint dysfunction as discussed in the literature ranges from experimentally induced joint effusion (Shakespeare et al., 1985), to pathological joint disease such as osteoarthritis (O’Connor et al., 1993), as well as the more subtle functional alterations that are commonly treated by manipulative therapists (Suter et al., 1999, 2000). For the purposes of this paper, the ‘‘manipulable lesion’’ will be referred to as an area of spinal dysfunction. There is a growing body of evidence suggesting that the presence of spinal dysfunction of various kinds has an effect on central neural processing. For example, several authors have suggested spinal dysfunction may lead to altered afferent input to the CNS (Bolton and Holland, 1996, 1998; Murphy et al., 1995; Zhu et al., 1993, 2000). Altering afferent input to the CNS is well known to lead to plastic changes in the way that it responds to any subsequent input (Brasil-Neto et al., 1993; Byl et al., 1997; Hallett et al., 1999; Pascual-Leone and Torres, 1993). Neural plastic changes take place both following increased (Byl et al., 1997; Pascual-Leone and Torres, 1993) and decreased (Brasil-Neto et al., 1993; Hallett et al., 1999; Ziemann et al., 1998) afferent input. Altered afferent input from joints can lead to both inhibition and facilitation of neural input to related muscles. Numerous studies of painful joints have shown arthrogenous muscle inhibition (Hides et al., 1994; McPartland et al., 1997; Stokes and Young, 1984). However, even painless experimentally induced joint dysfunction (joint effusion) has been shown to inhibit surrounding muscles (Shakespeare et al., 1985). This altered motor control was also shown to persist even after aspiration of the joint effusion (Shakespeare et al., 1985). In the early 1980s, Steinmetz et al. 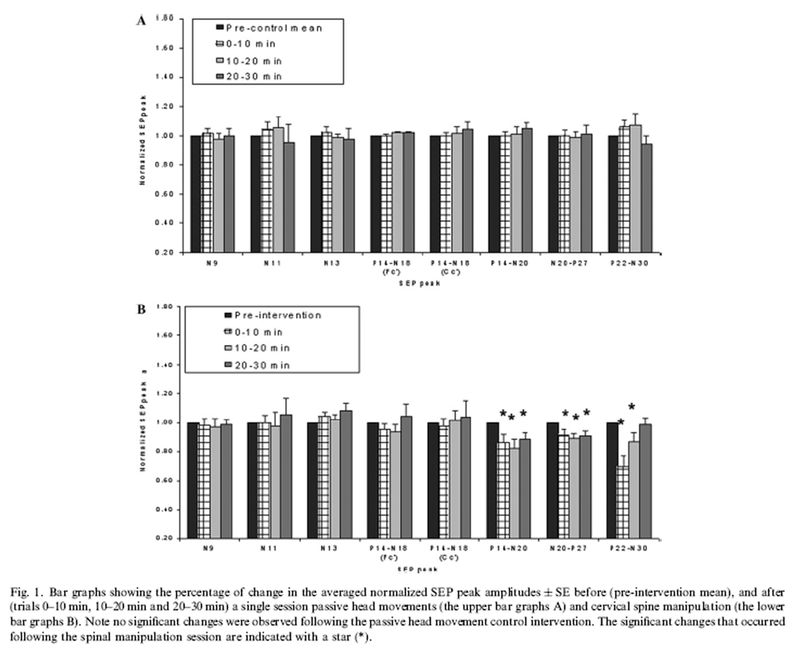 demonstrated that relatively short (15–30 min) episodes of moderately intense afferent input to the spinal reflex pathways of rats causes increases in neural excitability that persists for several hours (Steinmetz et al., 1982, 1985). Once these facilitated areas are established, there may be no need for ongoing afferent input to maintain the altered output patterns. Since these early experiments, numerous studies have shown rapid central plastic changes after injuries and altered sensory input from the body (for review, see Wall et al., 2002). This can explain the findings of Shakespeare et al. (1985) of altered motor control persisting even after aspiration of the joint effusion. This process provides a potential explanation for altered neural processing as a result of joint dysfunction, and a rationale for the effects of spinal manipulation on neural processing that have been described in the literature. Given that spinal dysfunction would alter the balance of afferent input to the CNS we propose that this altered afferent input may over time lead to potential maladaptive neural plastic changes in the CNS. We further propose that spinal manipulation can effect this. By recording SEPs and monitoring the peripheral nerve afferent volley, it is possible to determine where in the somatosensory pathway changes induced by spinal manipulation may be occurring. Twelve subjects (five women and seven men), aged 20–53 (mean age 29.9), participated in the spinal manipulation study. An additional twelve age-matched subjects (4 males and 8 females), aged 21–35 (mean age 27.1 years), participated in the passive head movement control study. The subjects were allocated into either group in a pseudo-randomized order. It was decided in advance that the first 12 volunteers that fit the inclusion/ exclusion criteria for the study would become the manipulation group as this would enable the next 12 subjects to be age matched, if needed. However, both groups were of similar ages, so no additional age-matching was necessary. All 24 subjects agreed to have their cervical spines manipulated and/or their head moved by the researcher, and no subject knew which group they were taking part in prior to their experimental session taking place. To be included subjects could not have a history of neurological disease. The subjects were required to have a history of reoccurring neck pain or stiffness (e.g., repeatedly present during the performance of certain tasks such as work or study). However, at the time of the experiment all subjects were required to be pain free. This was done in order to assess the potential effects of joint manipulation delivered to dysfunctional joints alone without the presence of acute pain, as the presence of pain alone is known to induced a significant reduction of the post-central N20–P25 complex and a significant increase of the N18 wave (Rossi et al., 2003). Table 1 contains the experimental subjects’ details, including their neck complaint history and known past neck (and/or head) trauma. Informed consent was obtained and the local ethical committee approved the study. All SEP recording electrodes (7 mm Ag/AgCl Hydrospot ™ disposable adhesive electrodes from Physiometrix) were placed according to the International Federation of Clinical Neurophysiologists (IFCN) recommendations (Nuwer et al., 1994). Recording electrodes were placed on the ipsilateral Erb’s point, over the C6 spinous process (Cv6), and 2 cm posterior to contralateral central and frontal scalp cites C3/4 and F3/4, which will be referred to as Cc', and Fc', respectively. All recording electrodes were referenced to the ipsilateral earlobe. The C6 spinous electrode was also referenced to the anterior neck (tracheal cartilage). The Erb’s point electrode and the central Cc' electrode were also referenced to the contralateral shoulder, as SEP components originating from subcortical regions are best recorded with a non-cephalic reference (Ulas et al., 1999). A ground electrode was attached to Fz. Stimuli consisted of electrical square wave pulses of 1 ms duration delivered through Grass gold cup 7 mm electrodes (impedance < 5 kΩ). The stimulating electrodes (cathode distal) were placed over the median nerve at the wrist of the dominant arm. Stimuli were delivered at 1.25 times motor threshold using a constant current stimulation at a rate of 1.98 Hz, a rate that does not lead to SEP attenuation (Fujii et al., 1994; GarciaLarrea et al., 1992). Sweep length was 55 ms (5 ms pre-stimulus and 50 ms post-stimulus) and filtering bandwidth was 3–1000 Hz (6 dB octave roll-off). A total of 500 sweeps were averaged using a purpose written LabView 5.1® program and the averaged waveform was displayed in an analysis panel from which the waveforms of interest were measured for amplitude and latency. The amplitude of the individual SEP components was measured from their peak to the preceding or succeeding trough according to the IFCN guidelines (Nuwer et al., 1994). According to the guidelines the N11 peak amplitude was measured to the preceding positive trough and the N13 to the succeeding positive trough (Nuwer et al., 1994). The latencies were recorded at their maximal peak of each component. We identified and analyzed the following SEP components: the peripheral N9, the spinal N11 and N13, the far-field P14–N18 complex (which was analyzed from both the frontal and parietal recording sites), the parietal N20 (P14–N20 and N20–P27 complexes), and the frontal N30 (P22–N30 complex). Spinal manipulation intervention This intervention consisted of spinal manipulation of the subjects’ dysfunctional cervical joints, which was determined by a registered chiropractor. The clinical evidence of joint dysfunction includes tenderness to palpation of the relevant joints, restricted intersegmental range of motion, palpable asymmetric intervertebral muscle tension, abnormal or blocked joint play and end-feel of a joint, and sensorimotor changes in the upper extremity (Fryer et al., 2004; Hestboek and Leboeuf- Yde, 2000). The most reliable spinal-dysfunction-indicator is tenderness with palpation of the dysfunctional joint (Hubka and Phelan, 1994; Jull et al., 1988). Cervical range of motion (Rheault et al., 1992; Youdas et al., 1992) has also been shown to have good inter- and intra-examiner reliability. For the purpose of this study spinal dysfunction was therefore defined as the presence of both restricted intersegmental range of motion and tenderness to palpation of the joint at at least one cervical spine segment. This was detected in the following manner. The examiner, a registered chiropractor with at least seven years of clinical experience, would passively move the subjects’ head, while palpating and stabilizing over the zygapophyseal joints. For each spinal segment the head would be gently and passively moved from neutral position to the maximal range of lateral flexion in the coronal plane, to both the left and the right. If this movement appeared restricted, the examiner would apply gentle pressure to the joint, while watching for signs of discomfort from the subject. The examiner would also ask the subject if the pressure to the joint elicited pain. Spinal segments that were deemed both restricted in lateral flexion range of motion and elicited pain on palpation were defined for the purpose of this study to be dysfunctional. The spinal manipulations carried out in this study were high velocity, low amplitude thrusts to the spine held in lateral flexion, with slight rotation and slight extension. This is a standard manipulative technique used by manipulative physicians, physiotherapists, and chiropractors. The mechanical properties of this type ofCNS perturbation have been investigated, and although the actual force applied to the subjects’ spine depends on the therapist, the patient, and the spinal location of treatment, the general shape of the force-time history of spinal manipulation is very consistent (Hessell et al., 1990), and the duration of the thrust is always less than 200 ms (for review, see Herzog, 1996). The high velocity type of manipulation was chosen specifically since previous research (Herzog et al., 1995) has shown that reflex EMG activation observed following manipulation only occurred following high-velocity low amplitude manipulations (as compared to lower velocity mobilizations), and would therefore be more likely to alter afferent input to the CNS and lead to measurable SEP changes. Passive head movement intervention The passive head movement intervention was carried out by the same chiropractor who had pre-checked the subjects for spinal dysfunction and who performed the spinal manipulations for the spinal manipulation experiment. The passive head movement intervention involved the subjects’ head being passively laterally flexed, and slightly extended and rotated to a position that the chiropractor would normally manipulate that person’s cervical spine, and then return the subjects head back to neutral position. This was repeated to both the left and the right. However, the experimenter was particularly careful not to put pressure on any individual cervical segment. Loading a joint, as is done prior to spinal manipulation, has been shown to alter paraspinal proprioceptive firing in anesthetized cats (Pickar and Wheeler, 2001), and was therefore carefully avoided by ending the movement prior to end-range-of-motion when passively moving the subjects’ heads. No spinal manipulation was performed during any passive head movement experiment. The passive head movement experiment was not intended to act as a sham manipulation but to act as a physiological control for possible changes occurring due to the cutaneous, muscular or vestibular input that would occur with the type of passive head movement involved in preparing a subject/patient for a cervical manipulation. All the subjects’ cervical spines were first checked by a registered chiropractor to determine if and where their spines would be manipulated. If the subjects were judged to have cervical spine dysfunction the relevant information (including detailed medical history) was then obtained. All subjects were also screened for evidence of vertebral artery ischemia, with their head in a position of extension, lateral flexion and rotation, which are neck positions shown to have the greatest mechanical stress to the contra-lateral vertebral artery (Arnold et al., 2004). Subjects were also screened for other contraindications for cervical manipulation, such as recent history of trauma, known conditions such as inflammatory or infectious arthropathies, or bone malignancies. Prior to any SEP peak analysis the data files were coded by an independent person to reduce any bias during SEP peak amplitude and latency analysis. The first baseline SEP trial was used to familiarise the subjects with the electrical stimulation needed to elicit SEPs and was therefore discarded for all subjects. The following two pre-intervention SEP trials (trials 2 and 3) of both latencies and amplitudes were examined with the non-parametric Wilcoxon Signed Ranks test (as the SEP amplitude values did not follow a Gaussian distribution) prior to combining them into one set to ensure that there were no statistically significant differences. Once it was determined that there were no statistically significant differences, the two pre-intervention trials were collapsed down into pre-intervention mean values. The pre-intervention means and post-intervention data (trials 0–10 min, 10–20 min, and 20–30 min) were then decoded, grouped according to intervention and transferred into the SPSS statistical package for statistical analysis. Note that the frontal P14–N18 and the parietal P14–N20 were analysed post hoc at the suggestion of reviewers. Results of those SEP components should therefore be interpreted accordingly. As the SEP amplitude values did not follow a Gaussian distribution non-parametric analysis was carried out for our statistical evaluation. Non-parametric analysis or variance for repeated measures (Friedman test) was applied to latency and amplitude values for each SEP peak. Whenever a significant effect was found (p < 0.05), planned comparisons (Wilcoxon signed rank test) were executed. The planned comparisons that were made were between the pre-intervention averaged results and the subsequent post-intervention results. The level of significance was set at p < 0.05. Planned comparisons were chosen instead of post hoc analysis to minimize Type 1 error, without reducing the sensitivity to relevant effects (Perneger, 1998). This is also in accordance with previous SEP research (Rossi et al., 2003; Rossi et al., 2002). Table 1 shows the spinal manipulation subjects’ details, including age, gender, history of cervical pain or tension, and any known neck and/or head trauma. 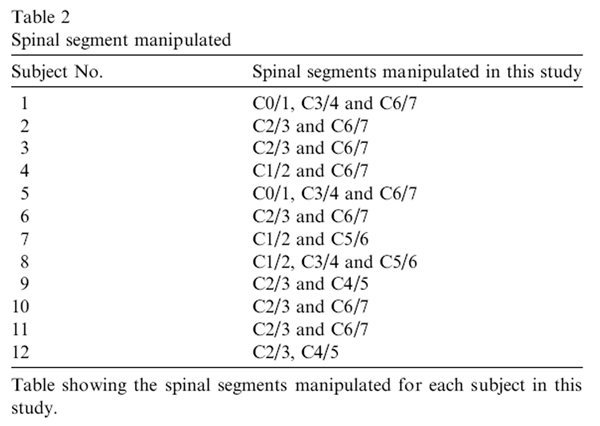 Table 2 shows the spinal segments manipulated for each subject in this study. There were no statistically significant differences between the pre-intervention trials prior to the passive head movement intervention. There were no significant changes observed in either latency or amplitude of any of the SEP peaks following passive head movement (see Fig. 1 and Table 3). Fig. 1 depicts the percentage of change in the averaged normalized SEP peak amplitudes ± SE before (pre-intervention mean), and after (trials 0–10 min, 10– 20 min and 20–30 min) the single session of passive head movements (the upper bar graphs A) and cervical spine manipulation (the lower bar graphs B). There were no statistically significant differences between the pre-intervention trials prior to the spinal manipulation intervention. Pre-intervention representational traces of the various SEP components of a single subject are shown in Fig. 2, with both pre-intervention trials to show reproducibility of SEP recordings. There were no statistically significant changes for the latency of any peak in the spinal manipulation condition. 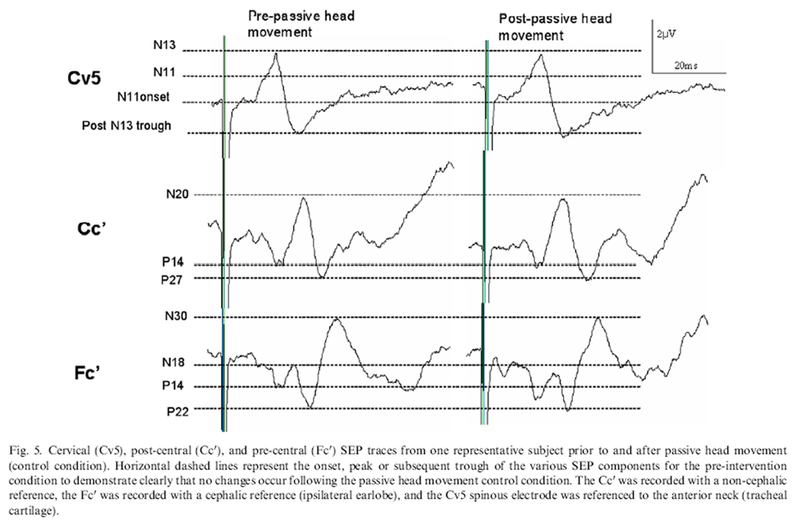 The peripheral N9, spinal N11 and N13, and brainstem P14–N18 (measured from both frontal and parietal recording sites) SEP peaks did not show any significant amplitude changes following cervical spine manipulation (see Fig. 1). However, the two cortical peaks, parietal N20 and frontal N30, significantly decreased in amplitude following the cervical spine manipulations (Parietal P14–N20 Friedman non-parametric ANOVA p = 0.025, parietal N20–P27 Friedman non-parametric ANOVA p = 0.006 and frontal P22–N30 Friedman nonparametric ANOVA p = 0.009), particularly during the first 20 min. The significant changes are marked with a star in Fig. 1 and Table 3. There was variability between the subjects, however the trend of the changes were similar for all subjects. The parietal P14–N20, the parietal N20–P27 and the frontal P22–N30 peak amplitudes decreased for every single subject during the first post-manipulation trial. By the second post-manipulation trial only one of the subjects’ parietal P14–N20 peak amplitudes returned to baseline levels and only two were at baseline values for the third postmanipulation trial. For parietal N20–P27 only two of the subjects’ peak amplitudes returned to baseline levels by the second post-manipulations trial and both remained at baseline values for the third post-manipulation trial. On the other hand, four of the subjects’ frontal P22–N30 peak amplitudes had returned to baseline values by the second post-manipulation trial, and by the third post-manipulation trial half the subjects’ frontal P22–N30 peak amplitudes had returned to baseline values. Table 3 contains the raw averaged SEP data for both the spinal manipulation group and the passive head movement group. The greatest amplitude attenuation occurred with the frontal P22–N30 SEP complex. It was on average over 30% attenuated during the first 10 min following the cervical spinal manipulation (trial 0–10 min), then on average 15% attenuated during the next 10 min (trial 10–20 min) (see Fig. 1). These changes were significant with the planned comparisons (Wilcoxon signed ranks test) (trial 0–10 min; p = 0.002, and trial 10–20 min; p = 0.019). Fig. 3 depicts the attenuation of the frontal P22–N30 SEP component for an individual subject. The parietal P14–N20 complex remained significantly attenuated with the planned comparisons (Wilcoxon signed ranks test) during all three post-manipulation trials, 0–10 min (p = 0.012), 10–20 min (p = 0.025), and 20–30 min (p = 0.036) (see Fig. 1). The parietal N20–P27 complex also remained significantly attenuated with the planned comparisons (Wilcoxon signed ranks test) during all three post-manipulation trials, 0–10 min (p = 0.021), 10–20 min (p = 0.010), and 20–30 min (p = 0.010) (see Fig. 1). The parietal P14–N20 amplitude was attenuated by 12–18% of the pre-intervention amplitude. The parietal N20–P27 amplitude was only attenuated by 8–11% of the pre-intervention amplitude. Figs. 4 and 5 depict spinal, parietal and frontal representational traces of the various SEP components of a single subject prior to and after both the spinal manipulation and passive head movement interventions, respectively. 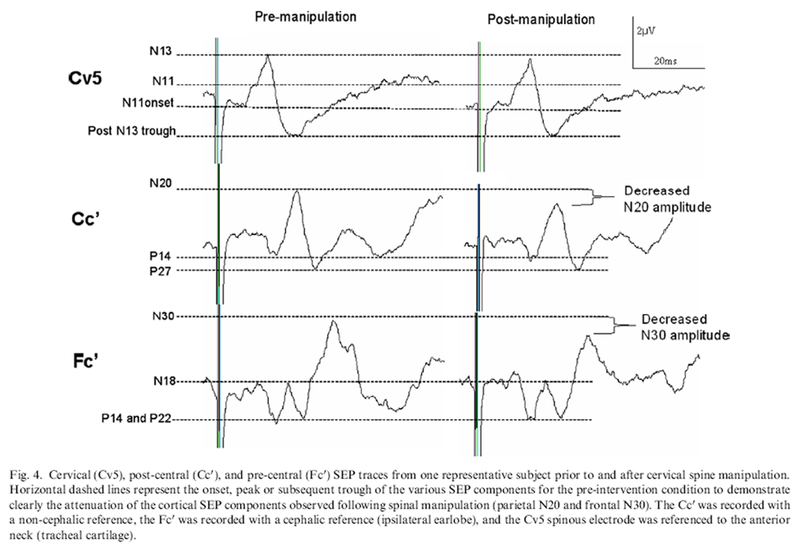 The horizontal dashed lines represent the onset, peak or subsequent trough of the various SEP components for the pre-intervention condition to demonstrate clearly the attenuation of both cortical SEP components (parietal N20 and frontal N30) following spinal manipulation. Note no changes occurred to any of the SEP components for this subject following the passive head movement control condition. The major finding in this study was that a single session of spinal manipulation of dysfunctional joints resulted in attenuated cortical (parietal N20 and frontal N30) evoked responses. On average the frontal N30 changes persisted for 20 min post-manipulation before returning to baseline levels. The parietal N20 changes persisted for at least 30 min, i.e. during all three post-manipulation recordings. To our knowledge, no prior study has shown persistent changes in neither somatosensory processing nor sensorimotor integration following spinal manipulation. 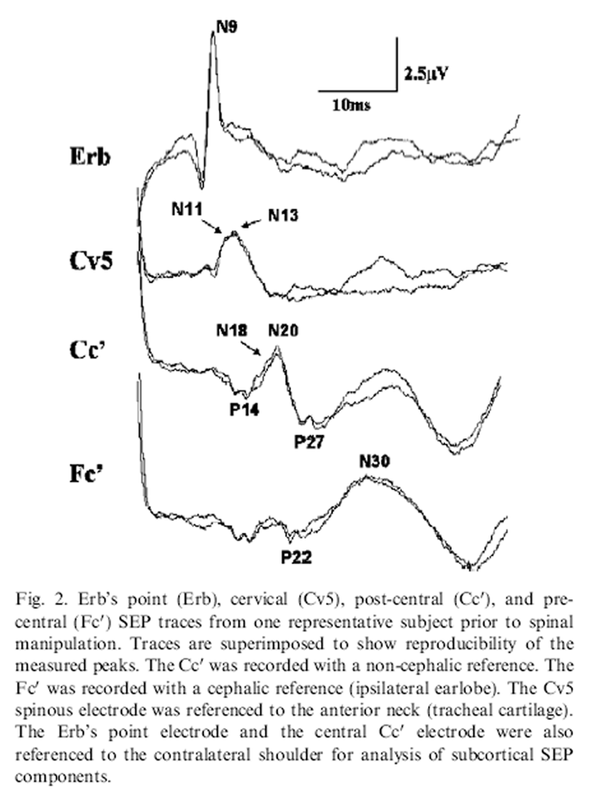 As the peripheral N9 peak, representing the afferent volley in the brachial plexus (Cracco and Cracco, 1976; Desmedt and Cheron, 1981; Jones, 1977), was unaltered the changes observed in our study most likely reflect central changes. However, the exact mechanisms of these central changes can only be hypothesized. These plastic changes lasted for the entire 30 min of recordings for the parietal N20 SEP component. The frontal N30 SEP peak changes lasted on average 20 min post-manipulation and then returned to baseline values. Some individual subjects demonstrated changes that persisted during all three post-manipulation trials (for example see Fig. 3 for lasting frontal N30 peak changes). Other subjects demonstrated changes in only the first (0–10 min) post-manipulation trial. Although no brainstem SEP peak amplitude changes were observed in this study, the design of the study does limit the ability to exclude the possibility that sub-cortical changes did occur. It is generally agreed that although 500 sweeps may be sufficient to record reliable peripheral Erb’s and cortical SEP potentials, far-field potentials such as subcortical P14–N18 do generally require a higher number of averaged sweeps (F. Mauguiere, 1999; Nuwer et al., 1994). The possibility for sub-cortical SEP changes following spinal manipulation does therefore need further investigation. The parietal N20 SEP component, generated in the primary somatosensory cortex (S1) (Desmedt and Cheron, 1980; F. Mauguiere, 1999 ; Nuwer et al., 1994) was significantly decreased during all post-manipulation blocks, both when measured from P14 to N20 and when measured from N20 to N27. This suggests that S1 processing was reduced post manipulation. One possible contribution to the reduced parietal N20 could come from enhanced active inhibition. For example, thalamocortical afferents monosynaptically activate an intracortical feed-forward inhibition to area 3b pyramidal cells supposed to generate parietal N20 (Desmedt and Cheron, 1980; F. Mauguiere, 1999; Nuwer et al., 1994) via the summation of excitatory postsynaptic potentials. The cervical spine manipulation(s) could have altered the afferent information originating from the cervical spine (from joints, muscles, etc), in turn altering the way that the 3b pyramidal cells respond to any subsequent afferent input such as the median nerve stimulation in our study. The passive head movement SEP experiment demonstrated that no significant changes occurred following a simple movement of the subject’s head. Our results are therefore not simply due to altered input from vestibular, muscle or cutaneous afferents as a result of the chiropractor’s touch or due to the actual movement of the subjects head. This therefore suggests that the results in this study are specific to the delivery of the high-velocity, low-amplitude thrust to the dysfunctional joints. The passive head movement experiment was to control for the potential neural changes due to the afferent traffic resulting from touch and head movement alone. It was not intended to be a sham manipulation. It is however also possible that subject arousal levels differed between the two groups and this may be a confounding variable in this study. It is for example known that sleep can prolong the latency and alter the morphology of the parietal N20 component of median nerve SEPs in healthy subjects (Emerson et al., 1988). The subjects in the manipulation group may have been anxious about the manipulations and therefore more alert than the subjects in the passive head movement group. As it is not possible to perform a sham adjustment, this is an inherent problem with this type of intervention that is difficult to overcome. It is the authors’ opinion that it is unlikely that the subjects in the passive head movement control condition were merely more relaxed throughout the study for several reasons. First of all there were no changes observed in any SEP peak latency in this study, and latency changes are known to occur with alterations in arousal levels (Emerson et al., 1988). Furthermore, the subjects’ frontal N30 SEP component returned to baseline by the third post-manipulation trial. It would not make sense that the subjects were anxious prior the manipulations, then all relaxed instantly following the manipulations, and then became anxious again towards the end of the study. The greatest amplitude change was observed with the frontal N30 component of the SEP peaks. Although some authors suggest this peak is also generated in the post-central cortical regions (i.e. S1) (Allison et al., 1989b, 1991, 1989a), most evidence suggests that this peak is related to a complex cortical and subcortical loop linking the basal ganglia, thalamus, pre-motor areas, and primary motor cortex (Kanovsky´ et al., 2003; Mauguiere et al., 1983; Rossini et al., 1987, 1989; Waberski et al., 1999). The frontal N30 peak is therefore thought to reflect sensorimotor integration (Rossi et al., 2003). The attenuated frontal N30 SEP peak observed in our study therefore suggests that there may be a decrease of activity in these cortical and subcortical loops linking the basal ganglia, thalamus, pre-motor areas and primary motor cortex resulting from median nerve stimulation, immediately following spinal manipulation, lasting on average 20 min. Again this may be due to altered afferent input following spinal manipulation. Previous research has shown that the frontal N30 component has independent cortical generators with a separate thalamo–cortical input (Balzamo et al., 2004; Mauguiere et al., 1983). Intracortical human recordings have also shown afferent information following median nerve stimulation project directly to the primary motor cortex (Balzamo et al., 2004), as has been documented previously in primates (Strick and Preston, 1982; Tanji and Wise, 1981). The frontal N30 component is therefore subject to more complex inputs than those flowing on from the parietal N20 generator alone. That the frontal N30 amplitude attenuation was on average 20% greater than the parietal N20 amplitude attenuation could be a reflection of the additional inputs from the separate thalamo–cortical pathways. The current study supports previous work that suggest muscle afferents (probably Ia) are the most likely mediators of the central neural effects of spinal manipulation (Bolton and Holland, 1996, 1998; Murphy et al., 1995; Pickar and Wheeler, 2001; Zhu et al., 2000, 1993). As mentioned, the N30 peak was the most dramatically attenuated SEP peak in this study. Previous work has demonstrated that the frontal N30 peak is the most vulnerable SEP component to vibration interference (Hoshiyama and Kakigi, 2000). Vibration of relaxed muscles, as used in Hoshiyama and Kakigi’s study, 2000, predominantly stimulates the group Ia fibres (from muscles spindles) (Roll et al., 1989). Group Ib and II fibres are not sensitive to this type of stimulation (Roll et al., 1989). This study demonstrates that the frontal N30 component is highly sensitive to changing levels of Ia afferent input (Hoshiyama and Kakigi, 2000). The significant attenuation of the frontal N30 SEP component observed in the current study thus suggests that spinal manipulation may alter Ia afferent processing. This is consistent with previous animal studies that have demonstrated that displacement of vertebrae is signaled to the central nervous system by afferent nerves arising from deep intervertebral muscles (Bolton and Holland, 1996, 1998; Pickar and Wheeler, 2001). In particular, both the velocity and relative position of the vertebral displacement appeared to be encoded by afferent nerve activity from intervertebral muscles (Bolton and Holland, 1996, 1998). If Ia afferents are the mediators of the central neural effects documented following spinal manipulation of dysfunctional joints, the persistent attenuation of the N20 component, seen in our study, may reflect a reduction of activity at S1 following spinal manipulation. It is possible that joint dysfunction leads to a bombardment of the CNS with Ia afferent signaling from the surrounding intervertebral muscles. Bolton and Holland’s (1996, 1998) observations of increased Ia activity from the paravertebral musculature surrounding surgically fixated vertebrae in cats support this theory. Furthermore, Pickar and Wheeler (2001) have demonstrated in anesthetized cats that both spindle cells and golgi tendon organs can respond to high-velocity, short-duration loads, i.e. loads with a force-time profile similar to that of a load delivered during spinal manipulation. Therefore, if spinal manipulation reduces excessive signaling from the involved intervertebral muscles this altered afferent input to the CNS may change the way it responds to any subsequent input, such as the electrical stimulation from the median nerve in this study. Episodes of acute pain, such as following an injury, may initially induce plastic changes in the sensorimotor system (for review, see Wall et al., 2002). Pain alone, without deafferentation, has been shown to induce increased SEP peak amplitudes (Tinazzi et al., 2000, 2004) and increased somatosensory evoked magnetic fields (Soros et al., 2001). As the sensorimotor disturbances are known to persist beyond the acute episode of pain (Jull et al., 2002; Sterling et al., 2003), and thought to play a defining role in the clinical picture and chronicity of different chronic neck pain conditions (Michaelson et al., 2003), then the reduced cortical SEP peak amplitudes observed in the current study following spinal manipulation may reflect a normalization of such injury/pain-induced central plastic changes, which may reflect one mechanism for the improvement of functional ability reported following spinal manipulation. The observations in the present study suggest that spinal manipulation of dysfunctional joints may modify transmission in neuronal circuitries not only at a spinal level as indicated by previous research (Herzog et al., 1999; Murphy et al., 1995; Symons et al., 2000), but at a cortical level, and possibly also deeper brain structures such as the basal ganglia. Further studies are needed to elucidate the role and mechanisms of these cortical changes, and their relationship to a patient’s clinical presentation. The head author was initially supported with a fellowship from the Foundation for Chiropractic Education and Research, and later by a Bright Futures Top Achievers Doctoral Scholarship. Allison T, McCarthy G, Wood CC, Darcey TM, Spencer DD, Williamson PD. Allison T, McCarthy G, Wood CC, Jones SJ. Allison T, McCarthy G, Wood CC, Williamson PD, Spencer DD. Arnold C, Bourassa R, Langer T, Stoneham G.
Doppler studies evaluating the effect of a physical therapy screening protocol on vertebral artery blood flow. 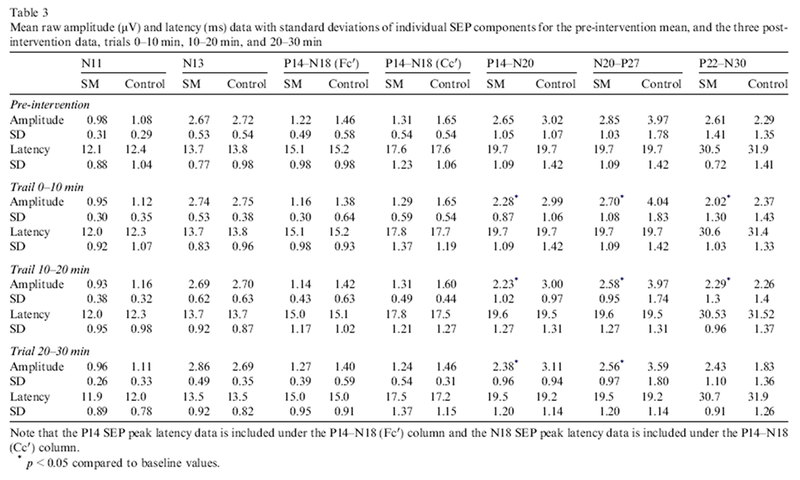 Balzamo E, Marquis P, Chauvel P, Regis J.
Short-latency components of evoked potentials to median nerve stimulation recorded by intracerebral electrodes in the human pre- and postcentral areas. Brasil-Neto JP, Valls-Sole J, Pascual-Leone A, Cammarota A, Amassian VE, Cracco R, et al. Byl NN, Merzenich MM, Cheung S, Bedenbaugh P, Nagarajan SS, Jenkins WM. A primate model for studying focal dystonia and repetitive strain injury: effects on the primary somatosensory cortex. Phys Ther 1997;77(3):269–84. Dishman JD, Ball KA, Burke J. Central motor excitability changes after spinal manipulation: a transcranial magnetic stimulation study. J Manipulative Physiol Ther 2002;25(1):1–9. Emerson RG, Sgro JA, Pedley TA, Hauser WA. State-dependent changes in the N20 component of the median nerve somatosensory evoked potential. Fryer G, Morris T, Gibbons P.
Paraspinal Muscles and Intervertebral Dysfunction: Part One. J Manipulative Physiol Ther 2004;27(4):267–74. Fujii M, Yamada T, Aihara M, Kokubun Y, Noguchi Y, Matsubara M, et al. GarciaLarrea L, Bastuji H, Mauguiere F.
Unmasking of cortical SEP components by changes in stimulus rate: a topographic study. Hallett M, Chen R, Ziemann U, Cohen LG. Electroencephalogr Clin Neurophysiol Suppl 1999;51:183–7. Mechanical, Physiologic, and Neuromuscular Considerations of Chiropractic treatment. In: Lawrence DJ, Cassidy JD, McGregor M, Meeker WC, Vernon. HT, editors. Advances in Chiropractic, vol 3. New York: Mosby-Year Book; 1996. p. 269–85. Herzog W, Conway PJ, Zhang YT, Gail J, Guimaraes ACS. Reflex responses associated with manipulative treatments on the thoracic spine: a pilot study. J Manipulative Physiol Ther 1995;18:233–4. Hessell BW, Herzog W, Conway PJ, McEwen MC. Experimental measurement of the force exerted during spinal manipulation using the Thompson technique. J Manipulative Physiol Ther 1990;13(8):448–53. J Manipulative Physiol Ther 2000;23(4):258–75. Hides JA, Stokes MJ, Saide M, Jull GA, Cooper DH. Vibratory stimulation of proximal muscles does not affect cortical components of somatosensory evoked potential following distal nerve stimulation. J Manipulative Physiol Ther 1994;17(9):591–5. Hurwitz EL, Aker PD, Adams AH, Meeker WC, Shekelle PG. Jull G, Bogduk N, Marsland A.
Jull G, Trott P, Potter H, Zito G, Niere K, Shirley D, et al. Kanovsky´ P, Bare M, Rektor I. Manipulation terminology in the chiropractic, osteopathic, and medical literature. In: The Chiropractic Theories: A Synopsis of Scientific Research. Baltimore: Williams and Wilkins; 1986, 15-2. Electroencephalography: basic principles, clinical applications, and related fields. Baltimore: Williams and Wilkins; 1999. Mauguiere F, Desmedt JE, Courjon J.
McPartland JM, Brodeur RR, Hallgren RC. Chronic neck pain, standing balance, and suboccipital muscle atrophy – a pilot study. J Manipulative Physiol Ther 1997;20(1):24–9. Michaelson P, Michaelson M, Jaric S, Latash ML, Sjolander P, Djupsjobacka M.
Nuwer MR, Aminoff M, Desmedt J, Eisen AA, Goodin D, Matsuoka S, et al. O’Connor BL, Visco DM, Brandt KD, Albrecht M, O’Connor AB. Sensory nerves only temporarily protect the unstable canine knee joint from osteoarthritis. Evidence that sensory nerves reprogram the central nervous system after cruciate ligament transection. What’s wrong with Bonferroni adjustments. Response of muscle proprioceptors to spinal manipulative-like loads in the anesthetized cat. J Manipulative Physiol Ther 2001;24(1):2–11. Rheault W, Albright B, Byers C, Franta M, Johnson A, Skowronek BS, et al. Intertester reliability of the cervical range of motion device. J Orthop Sports Phys Ther 1992;15(3):147–50. Roll JP, Vedel JP, Ribot E. Alteration of proprioceptive messages induced by tendon vibration in man: a microneurographic study. Rossi S, della Volpe R, Ginanneschi F, Ulivelli M, Bartalini S, Spidalieri R, et al. Early somatosensory processing during tonic muscle pain in humans: relation to loss of proprioception and motor ‘defensive’ strategies. Rossi S, Tecchio F, Pasqualetti P, Ulivelli M, Pizzella V, Romani GL, et al. Somatosensory processing during movment observation in humans. Rossini PM, Babiloni F, Bernardi G, Cecchi L, Johnson PB, Malentacca A, et al. Rossini PM, Gigli GL, Marciani MG, Zarola F, Caramia M.
Noninvasive evaluation of input-output characteristics of sensorimotor cerebral areas in healthy humans. Shakespeare DT, Stokes M, Sherman KP, Young A. Reflex inhibition of the quadriceps after meniscectomy: lack of association with pain. Soros P, Knecht S, Bantel C, Imai T, Wusten R, Pantev C, et al. Steinmetz JE, Beggs AL, Molea D, Patterson MM. Long-term retention of a peripherally induced flexor reflex alteration in rats. Steinmetz JE, Lupica CR, Secard CM, Patterson MM. Effects of manipulating stimulation intensity and duration on fixation of a peripherally induced spinal reflex alteration in rats. Sterling M, Jull G, Vicenzino B, Kenardy J, Darnell R.
Development of motor system dysfunction following whiplash injury. The contribution of reflex inhibition to arthrogenous muscle weakness. Two representations of the hand in area 4 of a primate.II.Somatosensory input organization. Suter E, McMorland G, Herzog W, Bray R.
Decrease in quadriceps inhibition after sacroiliac joint manipulation in patients with anterior knee pain. J Manipulative Physiol Ther 1999;22(3):149–53. Conservative lower back treatment reduces inhibition in knee-extensor muscles: a randomized controlled trial. J Manipulative Physiol Ther 2000;23(2):76–80. J Manipulative Physiol Ther 2000;23(3):155–9. Submodality distribution in sensorimotor cortex of the unanesthetized monkey. Tinazzi M, Fiaschi A, Rosso T, Faccioli F, Grosslercher J, Aglioti SM. Tinazzi M, Valeriani M, Moretto G, Rosso T, Nicolato A, Fiaschi A, et al. Ulas UH, Odabasi Z, Ozdag F, Eroglu E, Vural O.
Waberski TD, Buchner H, Perkuhn M, Gobbele R, Wagner M, Kucker W, et al. Wall JT, Xu J, Wang X.
Youdas JW, Garrett TR, Suman VJ, Bogard CL, Hallman HO, Carey JR.
Normal range of motion of the cervical spine: an initial goniometric study. Zhu Y, Haldeman S, Hsieh CY, Wu P, Starr A. Do cerebral potentials to magnetic stimulation of paraspinal muscles reflect changes in palpable muscle spasm, low back pain, and activity scores?[comment]. J Manipulative Physiol Ther 2000;23(7):458–64. Zhu Y, Haldeman S, Starr A, Seffinger MA, Su SH. Ziemann U, Hallett M, Cohen LG. Mechanisms of deafferentationinduced plasticity in human motor cortex.